Milk + Sass Macaron for hair is the Persian inspired hair accessory that is every bit as novel as it is functional. Part high and detangler, part compact mirror, and all around chic, the patented Macaron for hair brings a fun, fashionable, and travel-friendly edge to the typical detangling brush. The smart radial bristles are strategically placed at varying heights to allow for gentle detangling in half the time of traditional hairbrushes. That means less breakage, fewer headaches, and less frizz. Macaron for hair is made for every hair age, type, and texture, it can be wet or dry, curly or straight, thin or thick, natural or synthetic, young or mature. This is petite and lightweight making this ideal for traveling and on the go styling. 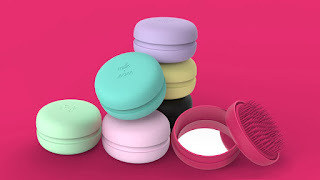 Always you do is pop on/pop off the cover works double-time as a bristle protector and compact mirror. It is ergonomically designed for optimal comfort and balance in any hand. Inspired by Paris and designed in California Macaron for Hair boasts a signature velvety touch in an iconic shape available in a rainbow of colors which include Raspberry, Black Licorice Framboise, Mint Citron, Lemon Pistachio, Rose Petal, and Lavender. These are suitable for women, men, teens, and kids with a retail price of $12.99. My Opinion: I was sent Lavender and Raspberry I had never used a brush like this before and I really like the compact design as I can just throw it in my travel bag and away I go on vacation or since it keeps the hair inside the compact and conceals the brush I can also just order my purse and take it on the road rather it be to work, meet up with friends or anywhere.